Navy QB Keenan Reynolds dives over from the 1 yard line to lead his team to their 13th straight win over Army. I look forward to the Army – Navy game every year. The atmosphere around that game is electric and it is something I would like to witness first-hand someday. It’s one of those unique games that brings out your patriotic pride and it’s hard to root against either team. The pregame atmosphere, with the Apache helicopters flying over for Army and the F-16’s for Navy makes for a really great experience. Another reason I like this game is that I’ve always liked option football. The first game I ever watched was Texas vs. Notre Dame in the 1970 Cotton Bowl, and I still have a love for the triple option. Navy came into the game as a bowl eligible team and had won 12 straight against Army. Army only had 4 wins this season and had no shot at going to a bowl game. However, in this game you can throw out the records. Both teams want the bragging rights of taking down the other team. Army struck early when sophomore corner Josh Jenkins used his speed to break past blockers and blocked a Navy punt. Wide receiver Xavier Moss scooped up the ball and returned it for a touchdown to give Army a quick 7-0 lead. Both defenses dominated the remainder of the first half until the 2:30 mark of the 2nd quarter. Army was driving and had the ball at the Navy 30 yard line. On 4th and 1, Army decided to go for the 1st down. Army converted, however, it was ruled that Navy had called timeout just prior to the play. On the replay of the down, the Navy defense stiffened and made the stop. It was a controversial call and it seemed to give the Midshipmen life. Navy junior quarterback Keenan Reynolds thrives in 2:00 drills and when the game is on the line. He mixed the run and the pass to move his team 70 yards in only 6 plays. He completed a 9 yard pass to sophomore receiver Jamir Tillman to tie the game at 7 apiece with just 0:11 left in the half. Navy continued their momentum in the 3rd quarter. Senior running back Ryan Williams-Jenkins returned the 2nd half kick to midfield. The Midshipmen got two first downs, then stalled at the Army 28 yard line, settling for a 45 yard field goal to take their first lead of the game, 10-7. Early in the 4th quarter, Reynolds drove his team 69 yards in 15 plays and Reynolds got the TD from 1 yard out to increase their lead to 17-7. Late in the game, Army QB A.J. Schurr drove the Black Knights into Navy territory and with 1:56 left in the game, connected on a 52 yard field goal. All of a sudden Army was within one score again. 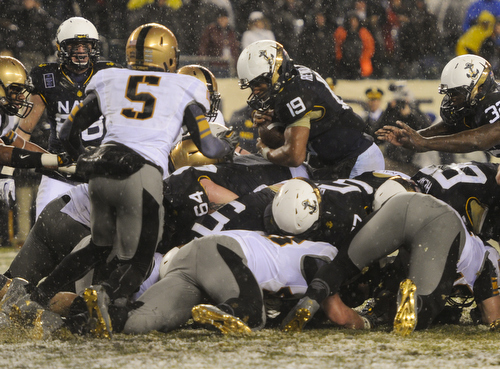 Army attempted an onside kick, but Navy recovered and ran the clock out to get their 13th straight win against Army. Keenan Reynolds, QB, Jr (5-11, 195): Doesn’t have great size, but he is a dynamic option QB. Has been the MVP of the Army-Navy game for three straight years. Very athletic. Has over 1,000 yards rushing and 21 TD’s for the year. Deceptive passer that thrives in big game situations. Throws well on the run. Slippery in the open field. Does a good job eluding the pass rush. Quick feet. Playmaker that takes care of the football. Completed 6 of 8 passes for 77 yards and 1 TD. Led the team with 100 rushing yards on 19 carries and scored a rushing TD. Geoffrey Whiteside, RB, Sr (5-10, 177): Good speed. Has ability to spin out of tackles. Gives good effort. Had 3 carries for 34 yards. Ryan Williams-Jenkins, RB, Sr (5-8, 162): Small, quick and fast. Can do a little bit of everything. Can catch the ball out of the backfield, return kicks and is a good blocker for his size. Had 2 carries for -7 yards, caught 2 passes for 15 yards and had a 41 yard kickoff return. Chris Swain, FB, Jr (6-1, 245): Big, physical north – south runner. Runs with good effort. Keeps legs churning after contact. Has the ability to get skinny in the hole. Good straight line burst. Had 9 carries for 47 yards. Noah Copeland, FB, Sr (5-10, 214): Quick through the hole. Bounces off tacklers. Runs with good pad level. Plays special teams. Had 12 carries for 30 yards and dropped a long pass that probably would have gone for a TD. Joey Gaston, RT, Jr (6-5, 281): Dominating run blocker with the ability to pancake defenders. Paul Quessenberry, DE, Sr (6-2, 251): Playmaking defense lineman that seems to always be around the ball. Had 6 tackles, 1 tackle for loss, 1 forced fumble and had a big stop on 4th down. Bernard Sarra, NT, Jr (6-1, 303): Strong at the point of attack. Ties up blockers. Had 4 tackles. Will Anthony, DE, Jr (6-1, 246): Does a good job stacking and shedding blockers. Very active. Leads the team in sacks and tackles for loss. Had 6 tackles, 2 tackles for loss, 1 sack, 1 fumble recovery and had a 3rd down stop to force a punt. Chris Johnson, OLB, Sr (6-1, 207): Undersized linebacker that uses his speed to make plays. Good athleticism. Knows how to get into passing lanes and be disruptive. Fights through blocks to make plays. Had 5 tackles, 1 tackle for loss, 1 sack and 1 batted pass. Jordan Drake, ILB, Sr (6-4, 220): Leads the team in tackles. A good blitzer that can pressure the QB. Led the team with 11 tackles, 1 tackle for loss, 1 sack and 1 pass breakup. Angel Santiago, QB, Sr (5-11, 201): Started the game. Tough and gritty. Able to improvise. Not flashy, but is steady with a good feel for running the option. Was 0 for 2 passing and had 10 carries for 21 yards. A.J. Schurr, QB, Jr (6-1, 209): Came into the game in the 3rd quarter. Speedy and athletic. Gave his team a spark, but also is careless with the ball. Completed 1 of 3 for 20 yards and rushed 9 times for 27 yards and had 1 fumble. Larry Dixon, FB, Sr (5-11, 239): Led the team with 1,1102 rushing yards and 9 touchdowns. Has 3,182 career rushing yards (6th all-time at Army). Tough north – south runner. Picks his way through traffic. Does a good job breaking tackles. Good straight ahead burst and balance. Good blocker. Surprisingly good receiver for a fullback. Led the team with 90 rushing yards on 14 carries and led them in receiving with 1 catch for 20 yards. Kelvin White, TE, Jr (6-3, 241): Former QB. Good blocker. Completed a 17 yard pass on a reverse. Richard Glover, NT, Sr (6-0, 270): A bit undersized for a nose tackle. Active and disruptive. Quick off the ball. Had 7 tackles and 2 tackles for loss. Joe Drummond, DE, Sr (6-2, 254): Stout at the point of attack. Good open field tackler. Wraps up well. Sheds blockers quickly. Smart and instinctive. Had a good game with 9 tackles, ½ tackle for loss and a fumble recovery. Stephen Ricciardi, OLB, Sr (6-0, 222): Quick off the edge. Able to get off blocks and make the tackle. Stops ball carriers in their tracks. Had 6 tackles and ½ tackle for loss. See you next Wednesday! If you like what you read, like us on Facebook and tell your friends. This entry was posted on December 17, 2014 by draftmaniacs in Scouting reports and tagged 2015 NFL draft, A.J. Schurr, Angel Santiago, Army Golden Knights, Bernard Sarra, Chris Johnson, Chris Swain, Geoffrey Whiteside, Jamir Tillman, Joe Drummond, Joey Gaston, Jordan Drake, Josh Jenkins, Keenan Reynolds, Kelvin White, Larry Dixon, Navy Midshipmen, NFL, NFL Draft, Noah Copeland, Paul Quessenberry, Richard Glover, Ryan Williams-Jenkins, Stephen Ricciardi, Will Anthony, Xavier Moss.